At the time of his stunning election victory in 2015, Sri Lanka‘s President Maithripala Sirisena claimed he would have been buried “six feet under the earth” had he lost that vote to incumbent Mahinda Rajapaksa. Yet almost four years later, there Sirisena was, administering the prime minister’s oath to his predecessor. The October 26 move plunged the South Asian country into a protracted political crisis, with the sacked Prime Minister Ranil Wickremesinghe, who had helped Sirisena win the presidency, crying foul and refusing to step down. For the next few weeks, Sri Lanka held its breath as tens of thousands rallied around the deposed leader, protesting against Sirisena’s “unconstitutional power grab”, and the ruling United National Party (UNP) fought successfully to prevent Rajapaksa obtaining a parliamentary majority. The “stubborn” and “arrogant” Wickremesinghe, he said, was not only “highly corrupt”, but had also failed to investigate an assassination plot against him. “I will not stay on in office for even an hour if Ranil Wickremesinghe becomes prime minister,” he reportedly said. And when it became clear Rajapaksa did not have the parliamentary backing to form a government, Sirisena dissolved the 225-member House and called snap elections nearly two years ahead of schedule. Once again, the president’s moves prompted allegations of constitutional violations and the Supreme Court stayed that decree. The restored parliament immediately passed two no-confidence motions against Rajapaksa. Still, Sirisena refused to back down. “I will not make [Wickremesinghe] prime minister … not in my lifetime,” he said in late November. Then, on Sunday, nearly two months after he triggered the turmoil, Sirisena, humiliated by a series of court interventions, walked back on his vow and reinstated the deposed prime minister. The country breathed a collective sigh of relief and tens of thousands of green-clad UNP supporters turned out to celebrate in the capital, Colombo. 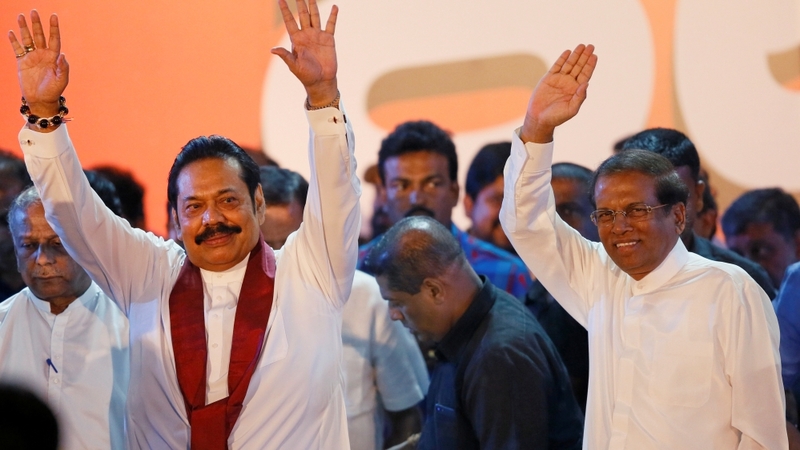 “The return of a constitutionally-sanctioned government in Sri Lanka, and the ultimate defeat of a slow-moving coup, was a major victory for the country’s embattled democracy,” said Alan Keenan, Sri Lanka project director at the International Crisis Group. That’s because the three key players in the conflict – Sirisena, Wickremesinghe and Rajapaksa – remain at loggerheads amid enduring diferrences – particularly over economic policy and constitutional reform, as well as accountability for war crimes and corruption. The current deadlock was only broken following a series of rulings by the Supreme Court. In a unanimous decision last week, the top court found Sirisena’s decree to dissolve parliament illegal. The seven-member panel said the parliament, which sat for the first time in August 2015, could not be sacked until four-and-a-half years had passed since its election. The next day, in a separate case, it upheld an interim decision by a court of appeal to bar Rajapaksa and his cabinet from holding office, owing to the no-trust motions. The embattled former president, who still remains popular with Sri Lanka’s Sinhalese majority for ending the country’s 26-year-war against Tamil separatists, finally resigned on Saturday. But he vowed to thwart Wickremesinghe’s reform agenda, which he claimed included a draft constitution that proposed devolving power to nine federal provinces – a move members of the Tamil minority have long lobbied for. “We will bring the forces opposed to the country down to their knees by organizing the people,” Rajapaksa, who served as president from 2005 to 2015, said. In a statement hours after Wickremesinghe’s reinstatement, he said his opinion on the newly returned prime minister has not changed. He said he only invited the deposed leader to form a government because he “respects parliament traditions and democracy”. “Even if I am impeached and even if I am imprisoned, history will judge me favourably for making the right decision,” he added. Relations between the pair were not always this way. In 2015, Sirisena and Wickremesinghe took over government promising to crack down on corruption and ensure justice for wartime atrocities. But their relationship soured as they clashed over economic policy, with the president unhappy over Wickremesinghe’s proposals to sell off assets to foreign companies. At the same time, Wickremesinghe was linked to a corruption scandal in which a central bank governor he appointed was accused of manipulating bond auctions, causing millions of dollars in losses to the state. Amid the infighting, Sri Lanka’s debt-saddled economy slowed further, leading to widespread anger. Sirisena, meanwhile, moved to shield soldiers accused of war crimes during the country’s bloody war, which ended in 2009. He said Wickremesinghe had arrested only government troops, and not looked into prosecuting former Tamil rebels living outside the country. Things came to a head in October, when an activist, citing information from a senior police officer, spoke to reporters of an alleged plot to kill Sirisena. It was Wickremesinghe’s alleged refusal to investigate that plot, according to Sirisena, that led to his dismissal. “They [the authorities] displayed utter lethargy,” he told the Ceylon Today newspaper in November. However, given the breakdown in relations, it is hard to see how Sirisena and Wickremesinghe could work together again, said Asanga Welikala, a Sri Lankan law professor at University of Edinburgh. He described Sirisena’s decision to reinstate the deposed prime minister and Rajapaksa’s resignation as a “tactical retreat”. Now, both Sirisena and Rajapaksa will “go back to political as usual”, Welikala said, and their strategy until the next general elections, due in late 2020, will be to “create chaos” and “derail the UNP government”. Shreen Saroor, a Muslim human rights activist, agreed. “This is going to get ugly. It’s going to be very tough,” she said. “The opposition is going to block everything and make the country ungovernable.” That’s because the UNP does not have the parliamentary strength to buck the opposition, she said. The party commands the backing of 103 legislators, but does not have the two-thirds support – even when counting votes from the 14-member Tamil coalition, which allied with the UNP on the no-confidence motions against Rajapaksa – to push through its economic and constitutional reforms. Saroor, who led civil society protests against Sirisena’s moves for seven weeks, said she also feared Rajapaksa may also turn to “demonising and terrorising” the minority Tamil and Muslim communities to improve his electoral prospects with the country’s Sinhalese majority, who make up 74 percent of the island’s 21 million people. 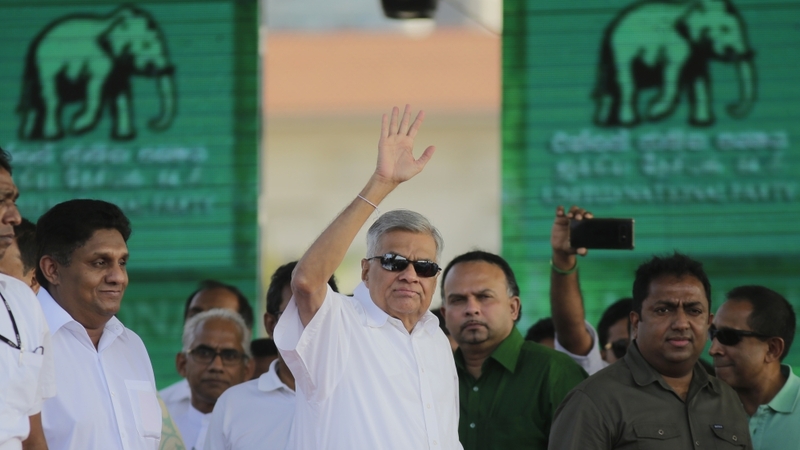 Faced with the prospect of an unruly opposition, the UNP could take two paths, analysts said. If the party wished to retain its recent growth in popularity ahead of the 2020 elections, it must take concrete steps to reduce economic pressures on the country’s poor, crack down on corruption within its own ranks, and provide reparations to victims of war and conflict. “That Wickremesinghe can do without Rajapaksa or Sirisena,” said Saroor. The ideal scenario and the sensible thing, said Welikala, at the University of Edinburg, was “for Wickremsinghe and Rajapaksa, even without Sirisena who has been weakened, to sit down and come to agreement to abolish the executive powers of the presidency and hold general elections”. “But I do not know who can mediate that. It doesn’t look very good,” he said.